You never know when a part of the kitchen appliance will break down or needs replacement. And being on a tight budget and in need of a new unit is a big headache. In replacing old ones, we usually prefer something cheap but can work somewhere in the same line as your old unit especially if it provided service for 15 or more years. And in looking for food disposers, we want it to have everything that we need at a cheap price. Luckily, there is a disposer that can do practically well in grinding up food waste and at a price less than $100. 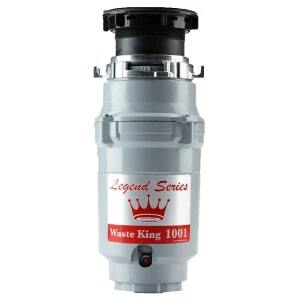 This disposer is the Waste King L-1001 Legend series. Of course, it can be a bit doubtful if it can really perform because of its price. To clarify more on what the disposer can do, here is a quick review about the unit. As mentioned before, the unit is priced below $100. It definitely creates a fuss if it can live up to the functions of a normal disposer. The answer is a yes, it’s a disposer so it will grind up food. But it isn’t as powerful as the other disposers out there that has ¾ HP in the motor. Comparing it with other units with a close range in price sand size such as L-111, the L-1001 has a better performance by having a 2600 rpm ability than the L-111 which only has a 1900 rpm. It has a magnet motor and a galvanized steel grind ring that helps in grinding. It also has stainless steel swivel impellers and galvanized turntable. If you do have the budget for it, better opt for the L-1001 due to its speed and power. For clarification, this unit is designed for mild usage only. It takes a bit longer than other grinders to do the job. It does grind up decently, but requires a smaller batch of food to be fed into it. It cannot hold large batches at once but it does have a continuous feed system. It will let you constantly feed food waste into the disposer while the grinding system is functioning. This is actually a convenient feature for such a small and low cost unit. Just do not over load it because you will create blockage and jamming inside. I will not lie, the unit is a bit noisy but not that much because I can still have a proper conversation with a friend and hear him with his normal voice volume. But depending on the type of sink that you have and if the sink can handle vibration from the disposer, you wouldn’t hear it working too loudly. The disposer is compact. With a measurement of 6.4 x 6.4 x 13.4 inches, it can fit in a tight-spaced under sink. Perfect and ideal for those who doesn’t have area or for those who wants to make more space in the sink. The voltage requirement is only 115 volts. It is also septic tank safe which is an added bonus. Another thing about it is that the power cord is included as well as the sink flange adapter and rubber insert. The rubber mouth can be taken out if you have a larger items to get rid of like chicken bones. But the rubber mouth will decrease in size overtime and will slip down and won’t be useful as before. It will be advisable to purchase a spare. It can be installed easily. It is simple and easy to understand. However, you have to check first if you need new piping under the sink to fit in the new Waste King unit. As cited before, it does come with the power cord. But if you want it to be hardwired, a few more materials are required for the alteration of the unit. But the general installation is speedy. The EZ mounting system comes with the unit as the connection bracket. It can be snapped in place swiftly and easily by giving it a simple twist. It can also be hooked up to a dishwasher. A plug must be removed first before any mounting of the dishwasher will happen. It comes with a 2 year warranty with an in home service. This means that any breakage due to standard and normal use, it will be fixed in your home at no charge to the purchaser. But the warranty will only cover mechanical failures. There are also other advantages of this unit over the other Waste king unit. Here are some of those pros and cons I was not able to mention before. Overall, it can finish the work well. The unit is good for a small to medium sized household. Not quiet but not too loud either. Take note that the Waste King Mount assembly can be different from other units, that means that it cannot be a direct replacement because the mounting bracket may vary. If you need a disposer that will replace the old one that you had and you wish to reuse the mounting system, you have to make sure to do ample research if they are compatible.